The science experiment was accidental. I thought I wanted to make a Thai curry for dinner this weekend because I remembered there was a container of coconut milk in the fridge. After spotting the copy of 50 Great Curries of India, a Christmas 2008 gift from my brother, on the bookshelf, I switched my plans to Parsee Red Chicken Curry, which still called for coconut milk. We got a new Cuisinart Mini-Prep for Christmas and I thought that would be the perfect thing for making the spice paste. Mini-Prep disagreed, churning out a rather chunky sauce with much effort. Next time, the full-sized monster comes out of the closet. Once the rest of the ingredients were prepped, I reached into the fridge for the coconut milk. 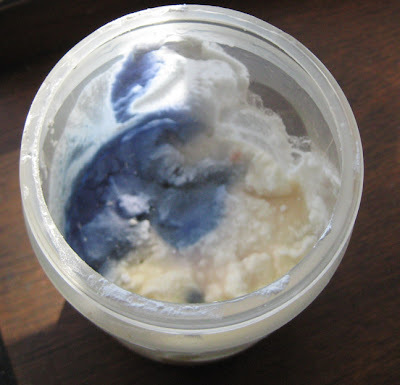 Did you know moldy coconut milk turns a rather lovely shade of blue? Although it seemed like mere days since I had put the milk in the fridge, it must have been several weeks. Time flies for the elderly, whether we're having fun or not. Luckily, I remembered there was about a cup of shredded coconut in the cupboard. Sweetened, but still - I could make coconut milk with warm water, as called for in the original recipe. It wasn't the same, but it was coconutty, so I used it. It was much thinner than the canned stuff (even in its pre-mouldered state) so in the last 10 minutes or so of cooking, I added about three tablespoons of heavy cream and skipped the vinegar so it wouldn't curdle. The other experiment came in during the side dish portion of the show. 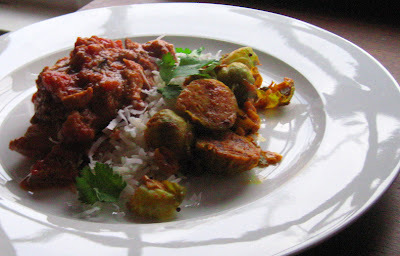 I wanted to make Brussels Sprouts in a sorta-kinda Indian manner, from a recipe found in Monica Bhide's Modern Spice (another Christmas gift from my brother). But...I didn't have several of the ingredients - no curry leaves, no leeks, no asafetida. I substituted scallions for the leeks and garlic for the asafetida, but didn't have anything to use in place of the distinctively-flavored curry leaves. When I had a stash of them in the freezer, I didn't know what to do with them. Now they're gone and I need them...but isn't that always the way it goes? Mr Minx really liked both dishes. Despite loving Indian food, we don't eat a lot of it anymore because the stuff we can get in restaurants tends to be both too rich and too heavy. 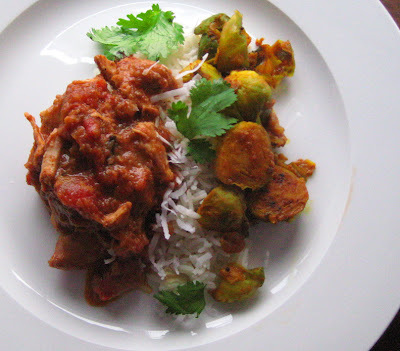 The Parsee-style chicken dish ended up being fairly light and was extremely mild on the spice. (I did not use the heavy amount of chiles called for, substituting a teaspoonful of ancho chile powder and about 1/8th teaspoon of cayenne.) The Brussels Sprouts weren't at all cabbage-y, and might have fooled a Sprout-hater into enjoying them. Next time I'd like to try making them with the leeks and curry leaves from the original recipe. Heat the vegetable oil in a large skillet. When it shimmers, add the mustard seeds. When they start to pop, add the Brussels Sprouts and green onions. Sauté for 5-6 minutes on medium until the vegetables start to brown. Add the cilantro, turmeric, coriander, ancho chile, and peanuts and cook another 2 minutes. Stir in the garlic, then add about a tablespoon or so of water, cover the pan, and reduce the heat to low. Cook for 10-12 minutes until the vegs are tender. Salt to taste and serve immediately, garnished with fresh cilantro. Do you recommend your curry book? Been looking for a good Indian cookbook and haven't settled on one yet. Yes, I do like 50 Great Curries a lot. I also like Monica Bhide's Everything Indian.